Tom Meredith passed away at the age of 58 on Friday, December 4th at home in Rancho Cordova. He leaves behind a wife, Keri, and 5 children, Krystal, Jessica, Matthew, Erik and Nick. He also leaves behind two wonderful grandchildren, Lucas and Giuliana, along with one on the way, Ella Patricia-Lynn. He was born to Patricia and Fred Meredith in Indiana. His family moved around following his father’s work prior to settling in Rancho Cordova around Tom’s kindergarten year. He attended Cordova Lane, Mitchell Jr. High and graduated from Cordova High Class of 1975. After high school, he started his own carpet business in EDH and was a “GreatSalesperson”. Following his father and brother, he worked as an electrician for 35 years. He was passionate about his job and his position as President of IBEW Local 340, the Electrical Workers Union. He was an active member of the Moose Lodge where he reunited with numerous old friends and shared great times! Tom was a very involved father with his kids, a loving husband, and lived for his grandchildren. An uncle, brother, cousin to Jerry Sichting of the NBA, brother-in-law, coach and an IBEW Brother for life! Tom’s favorite motto was “Never let the truth interfere with a good story!” Tom was preceded in death by both his mother and father, as well as his brother Larry. His celebration of life will be held on December 19th at 2 pm at St. John Vianney in Rancho Cordova. 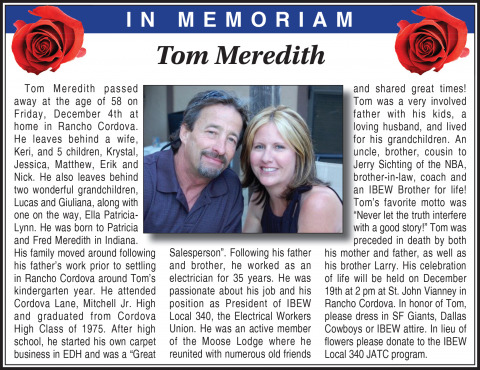 In honor of Tom, please dress in SF Giants, Dallas Cowboys or IBEW attire. In lieu of ﬂ owers please donate to the IBEW Local 340 JATC program.